What is Legends of Andor? 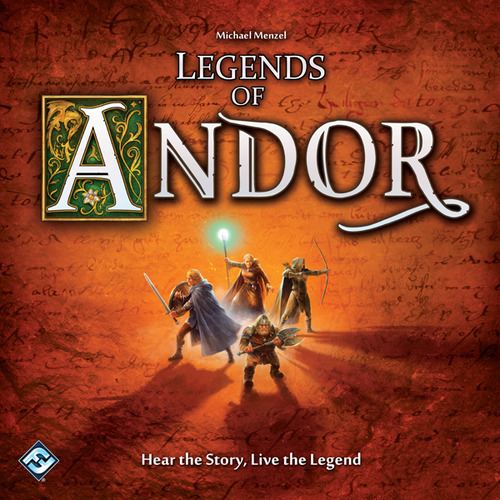 Legends of Andor, also known as Die Legenden von Andor, is a fantasy co-op board game. The kingdom of Andor is under attack and your group of heroes is the only defense against the oncoming horde. Throughout every game of Legends of Andor, you’ll be adventuring, slaying monsters, and attempting to protect your kingdom. Legends of Andor comes with five different campaigns (Legends) to choose from, each with its own storyline and slightly different gameplay. The first Legend is a tutorial that was designed to walk players through the mechanics of the game. The five scenarios are played with their own decks of cards, and each can be made more difficult with different cards and/or by shortening the time track. The choice of characters is relatively standard for a fantasy setting with the player’s choice of archer, dwarf, wizard or warrior. Each character has his or her own abilities and play a bit differently than the others. Each hero can be built on with equipment and special skills that you pick up while out on your campaign. During the game, heroes will take turns moving around Andor and taking actions. Along the way, they will reveal fog tokens, gain willpower (health), gain money, buy equipment, fight monsters, and more. After the heroes have taken their turns, an event card will be revealed and then the monsters will move around the board. The overall objective of the heroes is to complete the tasks for each Legend without allowing the monsters to overtake their castle. If the monsters make it to the castle a certain number of times, the kingdom falls and the heroes lose. You also lose if you fail any tasks before time runs out. Legends of Andor is a fantasy adventure game, but the fantasy aspect isn’t as strong as it is in games like Defenders of the Realm. Since Legends of Andor was designed as a puzzle that players must solve, the fantasy theme is lost a bit. However, players who actively try to get into the theme in games will have no problem imagining that they are these characters fighting monsters in a fantasy setting. Legends of Andor includes a time component that keeps the action and the story moving along, which is fantastic for a fantasy co-op game. As the stories progress, the monsters get harder to deal with. These mechanics make it impossible to get bogged down in just trying to get to one item that you need or trying to fight your way through an area. The stories are really well put together and fun to play out. We love the cooperative aspects of this game. You will often have to decide whether to stay together to have a bit more fighting power or separate to get more done. If you don’t talk it out with your teammates, you’ll have very little chance of winning. This game has one of the most attractive artwork that you will see in the board gaming world. Michael Menzel has created really well-designed, beautiful boards that makes the setup relatively easy and visually helps the flow of the game. Everything, from the character cards to the different items that you pick up, looks great. Because Legends of Andor relies on the campaign cards to drive it, there is a limit to how many times it can be played before it gets repetitive. However, Legends of Andor expansions have been published, as well as the ability to create your own campaign if you’re interested in keeping the game fresh yourself. EDIT: There is one Legend (Legend 3) that has a semi-randomized setup, so you can get plenty of games out of that one. Even though we expect cooperative games to have a puzzle element to them, Legends of Andor can feel a bit too much like a puzzle at times. The dice do give some randomness to fighting, but you always know where the monsters are going since they have a predetermined path. Knowing so much information ahead of time can take you out of the theme at times. 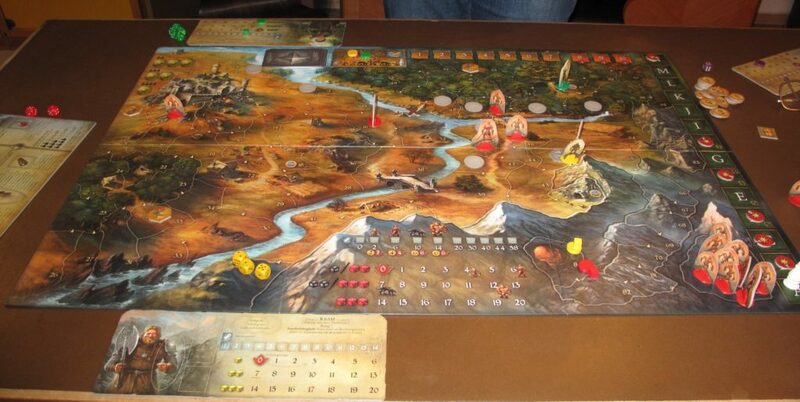 If you are a fan of fantasy and adventure games, chances are you will enjoy Legends of Andor. The players who may not be as interested would be those who are looking for more in-depth battles or a bit more strategy in their board games. Legends of Andor is one of our favorite cooperative board games. It is a unique co-op experience that combines solid gameplay and excellent storytelling. There may be similar fantasy themes out there, but there really aren’t any other games like Legends of Andor (at least none that we’ve played). Thanks for taking the time to read our Legends of Andor review!